This article briefly describes our experience and vision in implementing of typical “Uber for X” app. Over last few years the success of Uber has motivated a number of founders to create similar startups. And not only in the area of Taxi scheduling/management but multiple other areas where platforms managing micro- or occasional service jobs would build mobile apps as primary tools for communication with its users. Everyone wants to get a ride on “sharing economies” and “mobile era” trends transformed to “Uber for X” trend. And it’s probably the right thing to do? Homejoy, Handybook, Exec (acquired by Handybook): Uber for home cleaning. BloomThat, Proflowers, Floristnow: Uber for flowers. Boxed: Uber for bulked goods (Costco). Cambly: Uber for language tutoring. Dashlocker: Uber for dry cleaning. Flywheel, MyTaxi, Hailo, Taxi Hawk: Uber for taxis. Foxtrot, Minibar: Uber for alcohol. Pure: Uber for heterosexual dates. 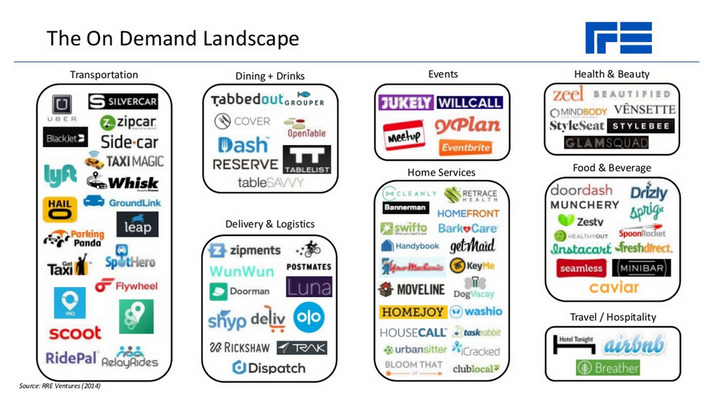 Sprig, Munchery, SpoonRocket, Push for Pizza: Uber for food. Grindr, Mister: Uber for gay dates. Hotel Tonight: Uber for last minute hotels. Icecream.io: Uber for ice cream. iCracked: Uber for iPhone repair. Medicast, Doctor On Demand, Ringadoc, dVisit: Uber for doctors (in-home). Plowz and Mowz: Uber for lawn mowing. Postmates: Uber for courier services. SixDoors: Uber for flowers and gifts. Swifto, Trottr, Urban Leash: Uber for Dog Walking. FlyCleaners, Wash.io, Cleanly: Uber for laundry. Fitmob: Uber for group fitness. Eaze, Canary, Meadow: Uber for marijuana delivery. Nimbl: Uber for cash delivery. Tennis Buddy: Uber for finding tennis partners. Trucker Path: Uber for truck drivers. HouseCall: Uber for home services professionals. LoungeBuddy: Uber for hotel lounges. YPlan: Uber for last minute events. Zeel, Unwind, Soothe: Uber for massages. Road Angels: Uber for roadside assistance. Updated 17.11.14: list links changed from techcrunch articles to services sites. Added titles to links, dofollow, enjoy your SEO. Have a mobile client for each platform you want to support (definitely starting from iPhone). Actually mobile clients are needed for both users and service providers. Most of them use iPhones after all. Have the same user interface connected to backend service to manage jobs and make orders from web-browser/PC for people who hate smartphones. Add sms notification or auto-dialing to service providers. Have administration portal for you to see the money you’ve earned! Connect it to payment gateway: PayPal, Skrill, BrainTree, etc. — would work great here. As an important part – try to sell a solution as a licensed platform to someone. Build infrastructure for multi-tenancy, white labelling, different discount plans, etc. Finally you should have a resellers portal, no business development would survive without it. Get profit and relax (for a minute and then get back to work with sales/marketing/PR/product landing pages testing/pivots/etc./etc.). And after multiple iterations and pivots, campaigns and redesigns and so much work done, we can’t expect anything less than 1 Billion exit.